CULTURE OF REVOLUTION · Intentional Destruction Destroy the perks of seniority EXECUTIVE PARKING SPOTS, dining rooms, separate floors, and hierarchal power. These are just a few examples of the perks that cripple agility. 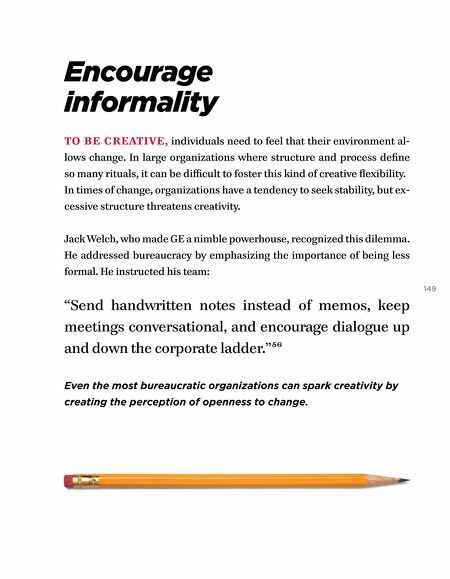 In a world of chaos and evolution, organizations must break apart everything that prevents being nimble and fast. 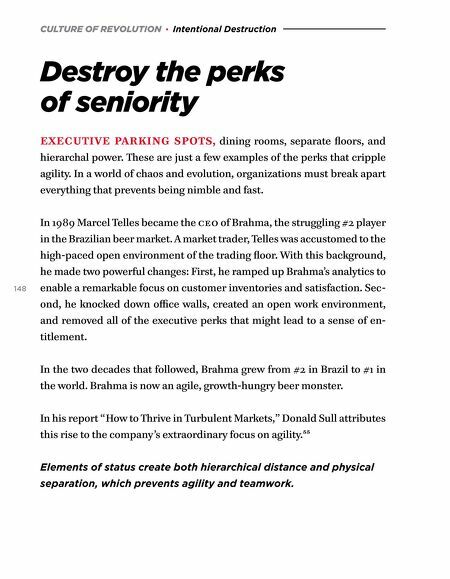 148 In 1989 Marcel Telles became the ceo of Brahma, the struggling #2 player in the Brazilian beer market. A market trader, Telles was accustomed to the high-paced open environment of the trading floor. With this background, he made two powerful changes: First, he ramped up Brahma's analytics to enable a remarkable focus on customer inventories and satisfaction. Sec- ond, he knocked down office walls, created an open work environment, and removed all of the executive perks that might lead to a sense of en- titlement. In the two decades that followed, Brahma grew from #2 in Brazil to #1 in the world. Brahma is now an agile, growth-hungry beer monster. In his report "How to Thrive in Turbulent Markets," Donald Sull attributes this rise to the company's extraordinary focus on agility.55 Elements of status create both hierarchical distance and physical separation, which prevents agility and teamwork.